Your home has subterranean termites. Or you realise there’s a good chance that it will if it’s not properly protected. But the only way to stop termites is an invasive process that requires the application of hundreds of litres of toxic spray under and around your home. Right? Not anymore. Imagine all this being replaced by the application in a closed and locked station of a termite bait containing a few grams of an active ingredient less toxic than table salt. 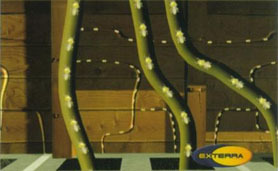 Welcome to the future of termite management – termite baiting with Exterra . Until recently, the almost exclusively used method of termite management was the application of a chemical termite barrier. The application of such a barrier to your home would typically involve spraying large volumes of toxic and environmentally persistent chemicals around and under its foundation in close proximity to you and your family. But Exterra radically changes all that. And as important as Exterra’s environment friendly features are, they’re just a big bonus. 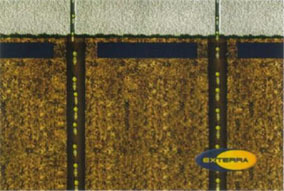 Exterra’s greatest advantage compared to chemical barriers is its ability to eliminate the actual source of your termite problem – the termite colony itself. Subterranean termites live in the ground and are commonly located under and around buildings. This is quite natural. Also natural is their appetite for wood, which they are designed by nature to consume and digest. Termites and their insatiable appetite for wood, create a problem only when they enter buildings in search of a new food source. around the entire building foundation at a high enough concentration that every possible point of potential termite entry into the building is protected. But what happens if the barrier is not continuous or is not strong enough? Good question. But you might not like the answer. Even the most carefully applied barrier treatments do not always form continuous and uniformly strong barriers between the building and the termite infested earth beneath them. This is because of the tedious nature of the application process and the difficulty of placing a barrier beneath an existing building. Almost inevitably, gaps or breaks are left in the barrier through which termites, which are always looking for an opening and a new meal, can invade. And variations can occur in the strength of the barrier. For example, forming a continuous and uniformly strong barrier under a concrete slab floor is rarely if ever possible. This means that if a slab floor cracks at a point at which the barrier is too weak or no barrier has been applied, termites can enter the building unimpeded and often undetected until they have done large amounts of damage. And termites can penetrate a crack as narrow as one millimetre. Gaps can be created in barriers when they are physically disturbed, weakened or simply wear out. For example, earth treated with a barrier toxicant may be disturbed or washed away. Even if a barrier is continuous and uniformly strong when applied, the strength of the barrier will naturally decrease over time as the toxicant naturally breaks down. Also, currently available barrier treatment products are not as long lasting as older barrier treatment chemicals that are now banned. In other words, the really strong, long lasting stuff is gone.